Affectionate and fun-loving, a group of dolphins enjoys its watery paradise. 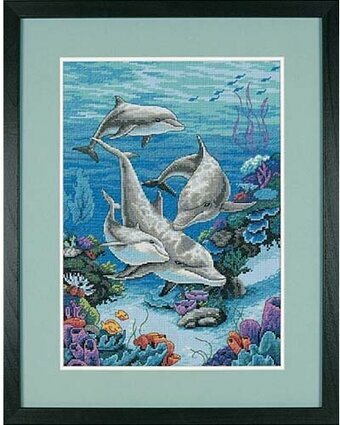 Stitched on 14 count blue Aida, this is truly an underwater delight! Kit contains cotton embroidery thread, 14 count blue Aida, thread palette, needle and easy instructions including a color accented chart. 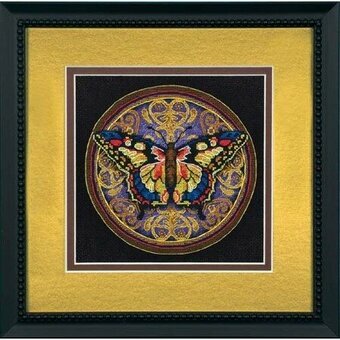 An embroidery hoop or 14" x 18" (36 x 46cm) needlework stretcher bars are recommended for stitching this design.-- Finished Size: 10" x 14" (25 x 36 cm) -- Designer: James Himsworth. "Conserve water, drink wine". Add a little humor to your cooking and entertaining with this delightful stamped cross stitch apron. Contains a poly/cotton apron, stamped in wash away ink, and easy instructions. Thread shopping list on back. One size fits all. NEEDLE AND THREAD NOT INCLUDED. 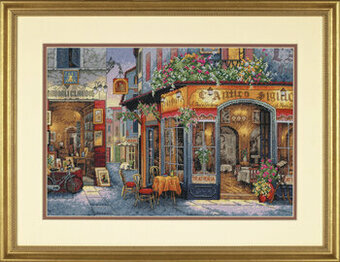 In this exquisite counted cross stitch scene, the warm glow from a trattoria beckons the passersby. Who could resist such a welcome? Kit contains cotton thread, 16 count dove grey Aida, color-coded thread sorter, needle, and easy instructions. Finished size: 16" x 11" (41 x 28 cm) Designer Info: Viktor Shvaiko. 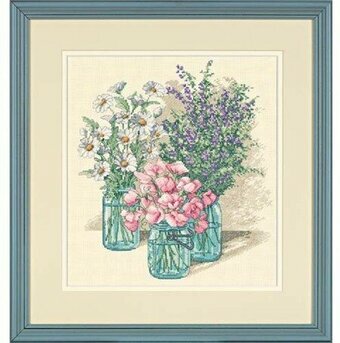 Looking like they were freshly picked, the Mason Jar Lineup counted cross stitch design from Dimensions brings lovely wild flowers to brighten any room. Half cross stitch is used for subtle shading effects. 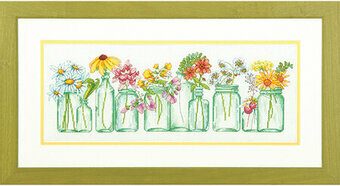 Complete kit includes 14 Ct. White Aida, presorted thread, needle, and easy instructions. Finished size: 18" x 7". Designed by Barb Tourtillotte. 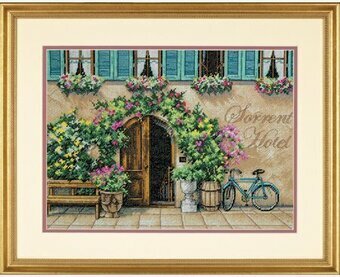 Old world charm and hospitality await you at the Sorrento Hotel. 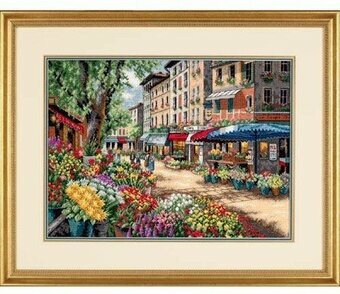 This charming counted cross stitch street scene brings to mind idyllic vacation days in Europe. Finished Size: 14" x 10" (36 x 25 cm). Kit contains presorted cotton thread, 14 count beige cotton Aida, needle, and instructions. Designer: Roger Duvall. These precious baby animal friends make an adorable quilt for your little one. The expressions on their faces are full of love and warmth. The design is stitched with cotton thread on a prefinished quilt. The printing on the quilt fades when washed. Look for the matching birth record and bibs, #73065 and #73066. 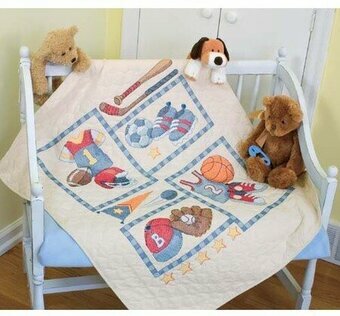 Kit contains cotton thread, design printed in ink that fades with washing on pre-finished poly/cotton quilt, needle, and easy instructions.-- Finished Size: 34" x 43" (86 x 109 cm) -- Designer: Ruth J. & Bill D. Morehead. 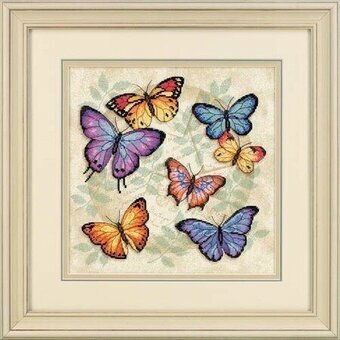 Beautiful butterflies in counted cross stitch, flutter against a background of subtle color that is both stitched and printed. Bursting with color, a grouping of butterflies dances across a printed background on 14 count ivory Aida. Half Cross Stitch is used to create the soft leafy background around these winged beauties, and blending filament adds sparkle to their wings. -- Finished Size: 11" x 11" (28 x 28 cm) -- Designer: Lori Turoscy. 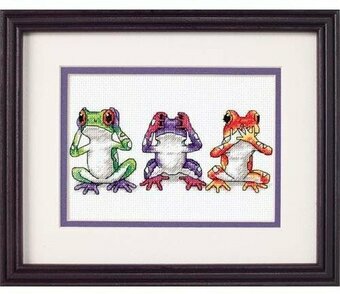 A colorful collection of quirky animals populates this charming stamped cross stitch quilt. 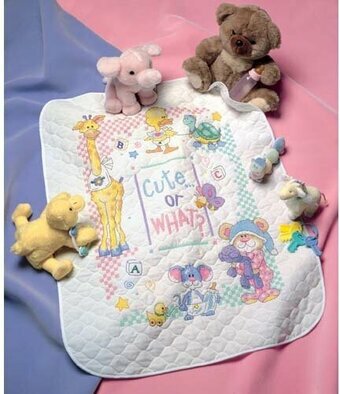 Journey to Cuteland when you stitch this adorable baby quilt with its whimsical characters and quirky approach. The kit includes cotton thread and printed poly/cotton quilt. 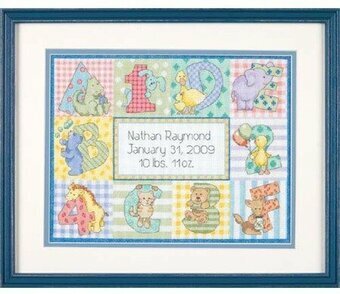 Check out our companion designs: #72723 Sweet Ducky Birth Record in Counted Cross Stitch, #72725 Cute Baby Bibs in Stamped Cross Stitch, and #80612 Baby Giggles Iron-on Transfers. Kit contains cotton thread, design printed on pre-finished poly/cotton quilt, needle, instructions. Finished Size: 34" x 43" (86 x 109 cm) -- Designer: Todd Trainer. Holiday motifs are featured on these elegant ornaments. 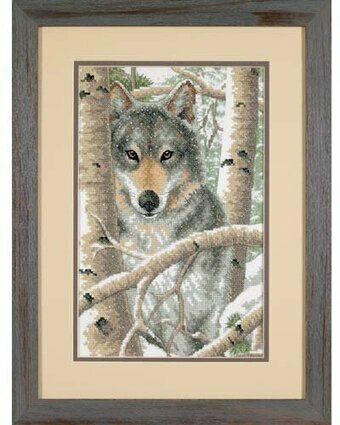 Display in your home or as a gift to someone on your Christmas list. 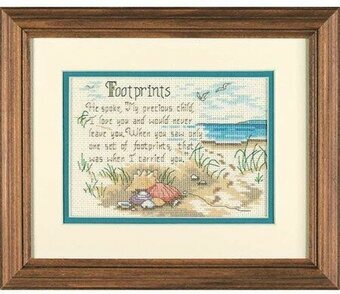 Cross Stitch Kit contains pre-sorted cotton thread, 14 count natural cotton Aida, polyester felt, wire, needle, and instructions and thread for hanging. Necessary but not included: thick craft glue and quilt batting. 5-3/4" x 2-1/4". 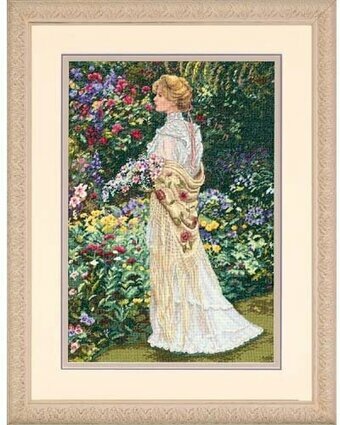 Join this lady in the garden for a stroll to gather flowers in this counted cross stitch design. There's a slight chill in the air as our lady strolls through her garden. 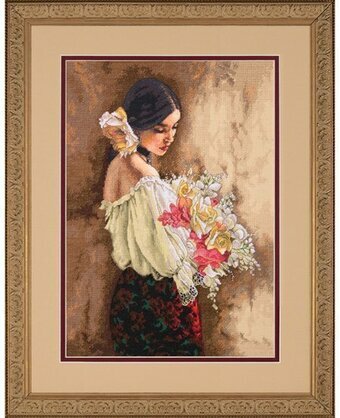 Her lacy shawl will chase that chill away as she picks a bouquet of flowers today. 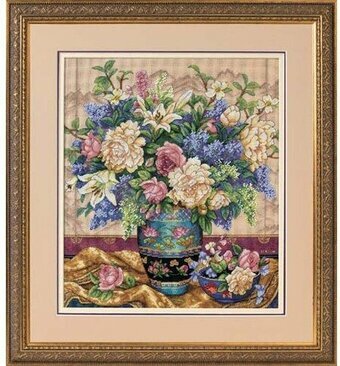 Stitched on 18 count ivory Aida, this elegant portrait uses both full and half cross stitches to a -- Finished Size: 11" x 16" (28 x 41 cm) -- Designer: Sandra Kuck. "Hear no evil, see no evil, speak no evil". 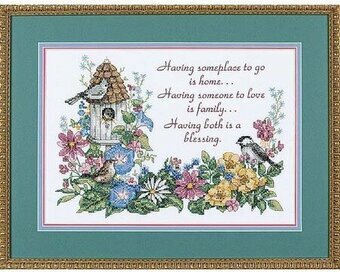 Counted cross stitch kit contains presorted cotton thread, 14 count white cotton Aida, needle, and easy instructions. 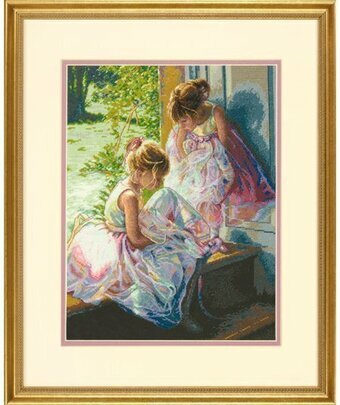 Finished Size: 7" x 5"
Kit contains cotton thread, 18 count ivory Aida, needle, and easy instructions. Finished Size: 7" x 5". "In music there is harmony, in harmony there is peace". 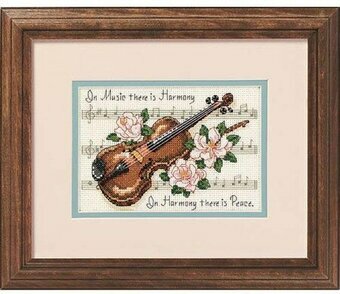 Music, harmony, and peace all combine in this enchanting design. The musical score creates a graceful background. Kit includes cotton thread and 14 count ivory Aida. Kit contains cotton embroidery thread, 14 count ivory Aida, needle and easy instructions including a color accented chart. Finished Size: 7" x 5". 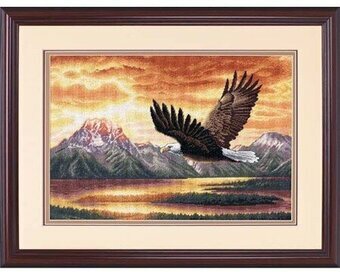 A bald eagle soars through the sky, ablaze with the colors of sunset, and over the purple mountain range in this vivid counted cross stitch scene. Soaring gracefully across the sunlit sky, the majestic eagle surveys his surroundings. 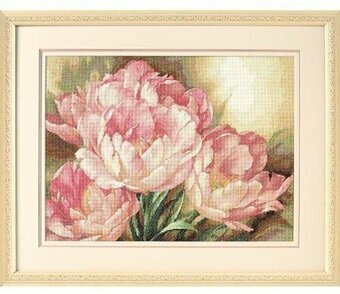 This dramatic design is stitched with warm shades of cotton thread on 18 count beige Aida using both full and half cross stitches. A color-coded thread sorter is included -- Finished Size: 16" x 11" (41 x 28 cm) -- Designer: R.W. Hedge. Complete kit includes cotton thread, printed white sailcloth, needle, and easy to follow instructions. Finished design size is 9" x 14". In counted cross stitch, this herd of white-tailed buck, hidden deep in the winter woods is a wondrous and rare sight to behold. Shhh. This band of bucks has heard the crunch of your footfall and looks ready to spring away. 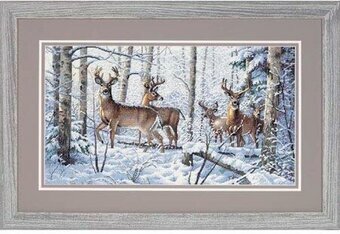 Stitched on 18 count white Aida, this vision of pristine winter would be the perfect gift for the outdoorsman on your list. 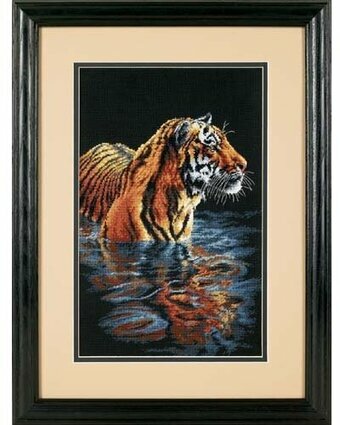 -- Finished Size: 18" x 10" (46 x 25 cm) -- Designer: Persis Clayton Weirs. Kit includes 18 count white aida, color-coded thread sorter with thread, needle and easy instructions. Kit contains cotton thread, 14 count White Aida, needle, and easy to follow instructions with an alphabet and numbers for personalizing. Design Size: 12" x 9"
Teach a child counted cross stitch with this whimsical Hedgehog Learn-a-Craft design from Dimensions. Easy, kid-friendly instructions make it fun to be creative! Complete kit includes 11 Ct. White Aida, cotton thread, 3" plastic hoop for finishing and framing, needle, and easy instructions. Finished size: 3"
Designed by Verdayle. 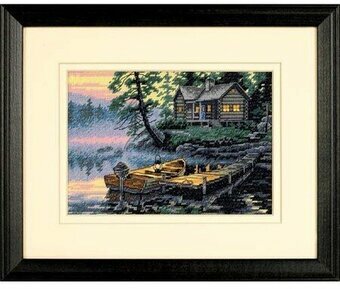 Complete stamped cross stitch kit includes cotton thread, printed white sailcloth, needle, and easy instructions. Finished size: 12" x 11". Be amazed as the wizard tames this beastly dragon in this counted cross stitch design. The power and light of the sorcerer's orb sears the inky darkness of the midnight hour and keeps the fearsome beast at bay. The 18 count black Aida accentuates the drama and the gold metallic adds luster to this magical scene. -- Finished Size: 12" x 14" (30 x 36 cm) -- Designer: Don Maitz. Kit contains: cotton thread, 14 count White Aida, needle, and easy instructions with an alphabet and numbers for personalizing. Finished size: 12" x 9". 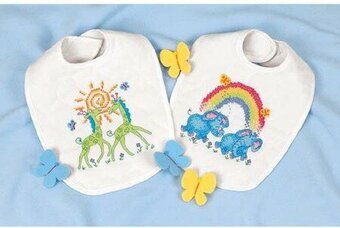 Noah's animals are arriving two by two on these sweet stamped cross stitch bibs. Colorful critters arriving two by two! Our adorable baby bib kit features two prefinished bibs with X's for stitching that fade when washed, cotton thread, needle, and easy instructions. 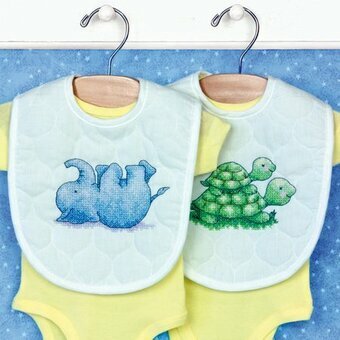 Kit contains cotton thread, two poly/cotton bibs printed in ink that fades with washing, needle, and easy instructions. Finished Size: 9" x 14" (23 x 36 cm) -- Designer: Tracy Flickinger. Kit includes cotton thread, 18 count black cotton Aida, needle, and easy instructions. Finished size: 6" x 6"
Kit includes cotton thread, 18 count Ivory cotton Aida, thread sorter, needle, and easy instructions. 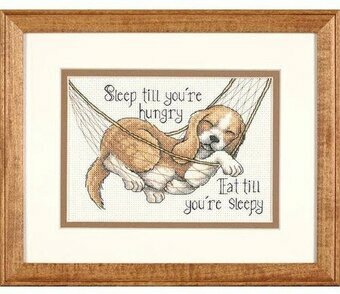 Finished Size: 15" x 11"
Animals of all shapes and sizes are featured on our adorable stamped cross stitch Savannah Quilt. 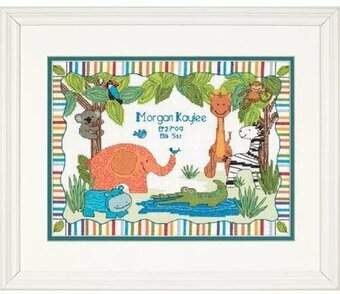 This design makes a wonderful baby shower gift. Finished Size: 34" x 43" (86 x 109 cm). 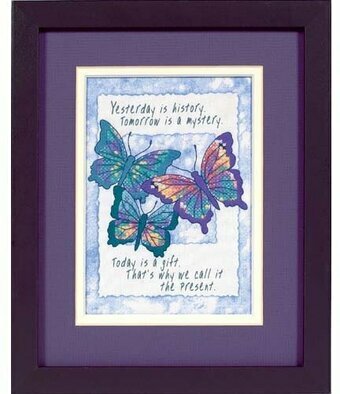 Contains presorted cotton thread, design printed in wash-away ink on prefinished muslin/polyester quilt, needle, and instructions. Designer: Wilma Sanchez. 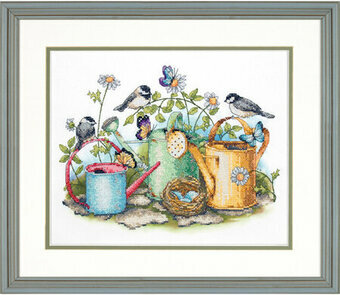 Complete kit includes cotton thread, 18 Ct. Black Aida, thread sorter, needle, chart and easy instructions. Finished size is 13" x 18". Designed by Matthew Hillier. "Yesterday is history, tomorrow is a mystery, today is a gift. That's why we call it the present". 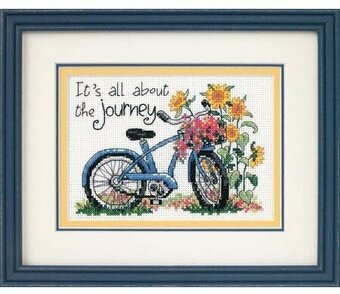 This inviting stamped cross stitch design reminds us to treasure each new day. The greatest gift life can give us is each new day. This design is stitched on sailcloth with a printed background and X's for placing your stitches. This simple reminder to treasure today will make a wonderful gift. Kit contains cotton thread, printed white sailcloth, needle and easy instructions.-- Finished Size: 5" x 7" (13 x 18 cm) -- Designer: Dimensions. Choo-choo! These bright-eyed creatures are pulling in to the station to announce baby's arrival! 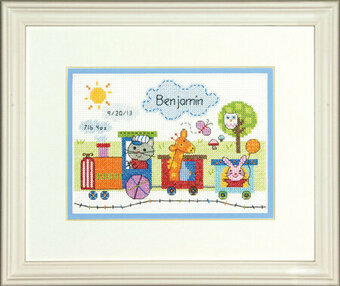 The Train Birth Record by Dimensions in counted cross stitch features a colorful array of threads. Size: 7" x 5". Designed by Jill McDonald. 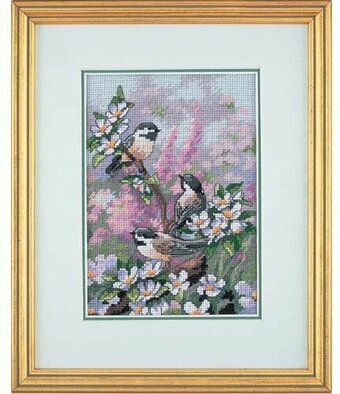 Counted cross stitch kit contains: Presorted cotton thread, 14 count white Aida, Needle, Easy instructions with an alphabet and numbers. 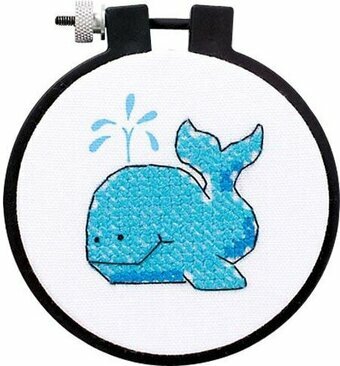 Package contains design printed on fabric, cotton embroidery thread, needle and easy-to-follow instructions. 14" x 11" (36 x 28 cm). 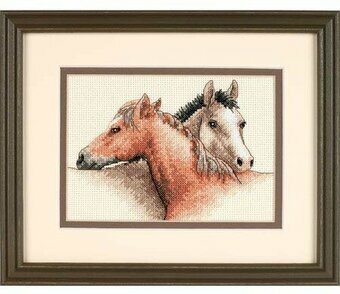 A blend of strength and tenderness is portrayed in this counted cross stitch piece. 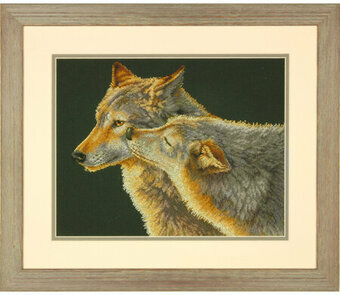 The dark fabric background makes the exquisite details of Wolf Kiss even more stunning. Finished Size: 14" x 11" (35 x 27 cm). Contains presorted cotton thread, 14 count black cotton Aida, needle and easy instructions. Designed by Bonnie Marris. Design by Lee Bogle. 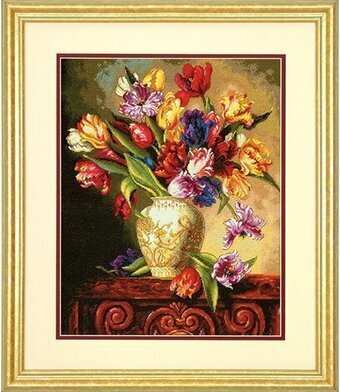 Half cross stitch is used in this design for artistic effect. Kit includes presorted cotton thread, 18 count beige cotton aida, needle, and instructions. Fabric size is 15" x 19". Finished size is approximately 11" x 15" (27 x 38 cm).